Cemac Commercial Interior are the suppliers of Shelving, Retail Shelving, Mobile Shelving, Panel Shelving, Post Shelving, Library Shelving, Precision Lockers, Filing Cabinets, Plan Cabinets, Cupboards, Smartstores, Screens, Desks, & Workstations. Cemac Commercial Interiors has been a major provider of partitioning and commercial fit outs in Christchurch for more than 40 years and has been responsible for some of the city's largest and best fit outs and partitioning projects. 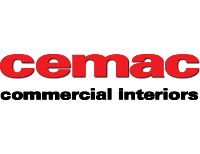 Proud of its reputation as a provider of work of the highest quality, Cemac Commercial Interiors can provide the client the very best in all interior work. We supply office furniture which include; partitions, filing systems, lockers, security cabinets, and shelving. We also provide shop and office fitter services. Cemac Commercial Interiors are well known for shelving system requirements for a range of well-known retail businesses.